Being present since 2012, AppFutura has become a staple in the IT industry and a reference for IT and Marketing firms around the world. With listings of over 8,000 companies worldwide and thousands of IT projects developed for satisfied clients, we are a team of experts in identifying the best IT and Marketing outsourcing companies and are confident in the authority the years in the field have given us. Company performance. We work closely in projects with buyers and service provider companies, which gives us a unique perspective in the performance of all IT and Marketing firms we collaborate with. Company reliability. Active firms are monitored and certified by the AppFutura team to make sure they are real established IT and Marketing businesses with a real team behind them. Company reviews. Thoroughly verified reviews by real clients are a key aspect of our ranking and listings, as they are the testament to the quality of the IT and Marketing companies listed. Company activity. Information provided on the company profile and activity as experts in collaboration spaces like our blog and forum also play a part in their ranking. 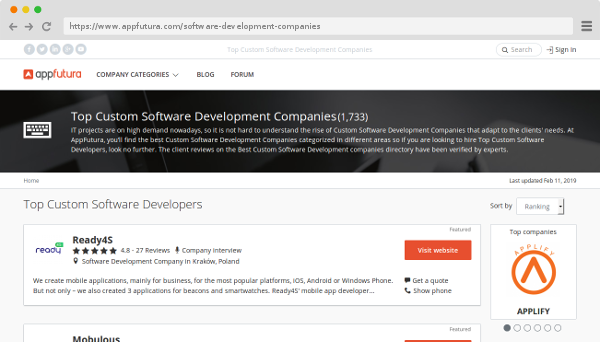 Why do IT companies trust AppFutura? Our platform allows service providers to improve their online reputation by showcasing their service offerings, gather verified reviews from former clients, and share expert content and resources in our content spaces. 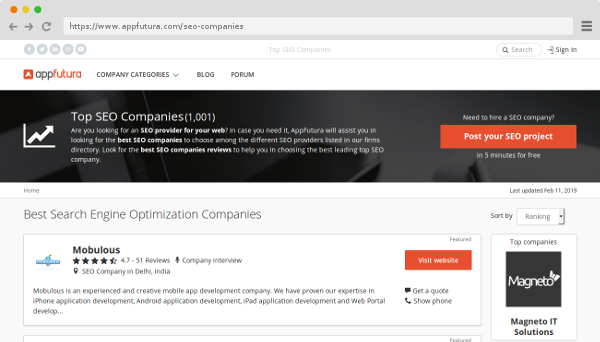 At the same time, this makes AppFutura a very interesting lead-generation tool for IT and Marketing Companies and a unique trusted source of feedback for buyers to make a decision. 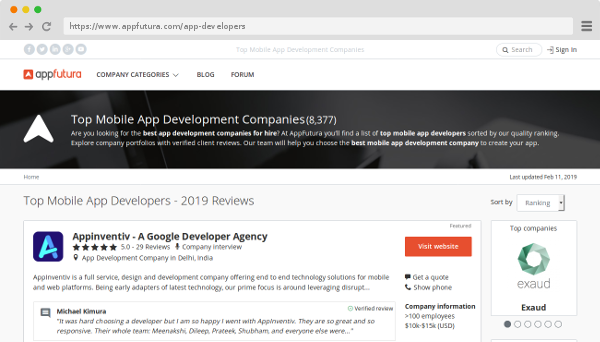 Learn more About AppFutura, read our Client Testimonials and Frequently Asked Questions or Contact Us. Read about our AppFutura Pro service.